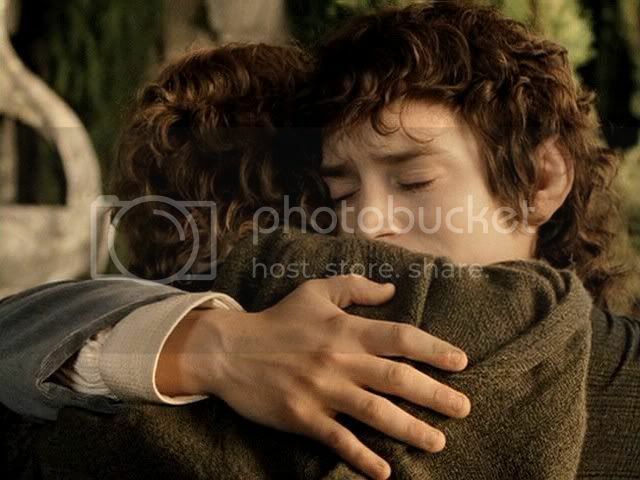 ~ screencap from "At the Grey Havens: Frodo farewells Merry and Pippin". I had not known of this poem by jan-u-wine when I originally posted my "Frodo farewells Merry and Pippin" screencaps on Sept. 23, 2006. Even if few will see it at this point, I want to add this poem to that post because it expresses so well what may have been Frodo's feelings as he bids his friends goodbye. If you are a fan of her work, here is jan-u-wine's Namárië. I was never much for LotR poetry until I read the poems of jan-u-wine. I think of what she writes more as "poetic fic" than poetry. It is quite unique in that way. It has the lyricism of poetry, and its economy—saying much with few words—but it opens the characters up to me with the depth of the best prose. Links to all other LotR screencaps: HERE.